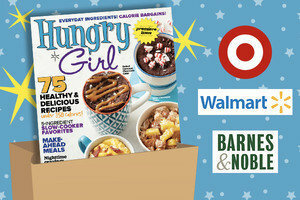 Hungry Girl Magazine Is Now in Stores! After an explosive preorder debut (the unprecedented traffic crashed the magazine website, which has since been fixed), Hungry Girl magazine is NOW officially available... both in stores and online! This is no ordinary magazine; it's a high-quality keepsake publication packed with brand-new Hungry Girl content. 75 Easy & Delicious Recipes Under 350 Calories! 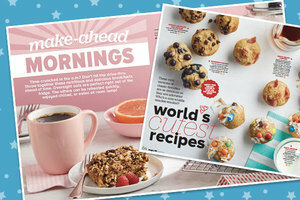 * Make-Ahead Mornings: Because who has time to make a healthy & delicious breakfast every morning? * World's Cutest Recipes: The Shot-Glass Chocolate Cheesecake is not to be missed! * 5-Ingredient Slow-Cooker Soups: Too-Easy Chicken Tortilla, Broc ‘n Cheese, Dreamy Zucchini... YUM. * Faux Fried Chicken Four Ways: The crunchy goodness of fried food without all the calories! Inspiring Weight-Loss Success Stories - Hear from three Hungry Girl fans who lost a collective 328 pounds! They share how they did it and how you can too. Gotta love those before & after photos! Tear & Take 2018 Supermarket List - Our latest grocery guide takes the guesswork out of guilt-free eating. Healthy staples and must-have food finds in an aisle-by-aisle list! Kitchen Hacks & How-Tos - Save time, money, energy, and calories with some borderline brilliant foodie tips & tricks. And in this issue, you'll find the essential visual guide to making spaghetti squash in an oven, microwave, slow cooker, or Instant Pot! Plus... 8 Things Every Chocolate Lover Needs, Bow Wow Bites (fun finds for your furry pals! ), Step It Up (ways to burn calories without leaving your house), and more! 1. In stores and on newsstands. 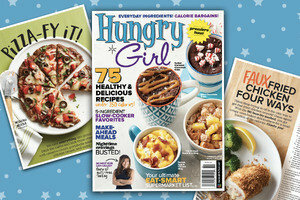 The debut (Spring) issue of Hungry Girl magazine is available in both the US and Canada. Find it at Walmart, Kroger, Albertsons, Safeway, Publix, Target, Whole Foods, Barnes & Noble, and other retailers. Supplies are limited, so if you see it, GRAB IT! 2. Order the premiere issue (shipping is free). Click here to have the Spring edition of this tremendous publication mailed to your doorstep. It doesn't get any easier than that! 3. Order the first two issues in one simple step. You know you're gonna want the Summer issue as well, so click to get both coffee-table magazines delivered. The Spring issue will ship right away, and the Summer one will be sent in April. And yes, shipping is free! Already got your copy? Post a pic with it on Instagram or on our Facebook page, and use the hashtag #HGmagazine! Today, January 17th, is National Hot Heads Chili Day. Control the heat in your chili with our EZ as 1-2-3-Alarm Turkey Chili, made in a slow cooker! Share this exciting news with a pal... Send to a friend NOW!